Yokogawa Meters & Instruments Corporation announces that it has developed the LS3300, an AC power calibrator that can accurately and stably produce a wide range of AC power outputs for the calibration of power meters and other types of measuring instruments, and will be releasing it for sale on July 14. As it comes with only those functions needed for power meter calibration, the LS3300 will dramatically reduce the initial cost for our customers. Measuring instruments such as power meters, thermometers, and multimeters that are used in product development and on production lines need to be calibrated periodically. Thanks to the recent widespread introduction of quality management systems that are compliant with ISO 9001 and other international standards, there is an increasing need for the calibration of measurement instruments. Many of the instruments used to calibrate power meters and the like are capable of simultaneous voltage and current output with phase control, and can also perform three-phase* AC power calibration if multiple calibration units are used in combination. These multifunctional instruments are expensive, are only capable of continuously outputting large currents for short periods, and are difficult to set up and operate for three-phase AC power calibration. As such, they do not meet the needs of customers who would like to calibrate smart meters and other power meters that require a large output current, calibrate single-phase AC power with a single device, and easily calibrate three-phase AC power. 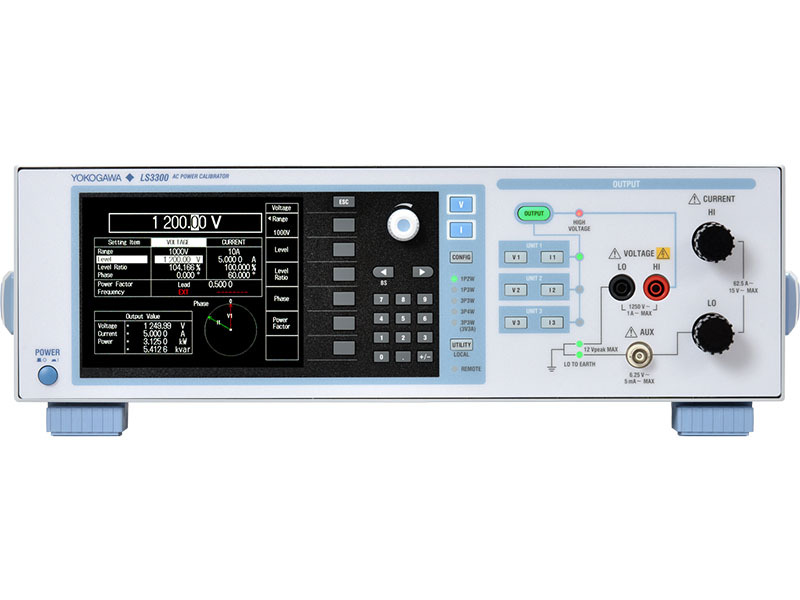 In response to such needs, Yokogawa Meters & Instruments Corporation has developed the LS3300 AC power calibrator. The LS3300 can calibrate AC voltage, current, and power as well as test both power phase and power factor using a wide range of set values. While costing considerably less than other instruments thanks to its inclusion of only those calibration functions needed for power calibration, the LS3300 delivers a high accuracy of ±0.045% and a superb stability of ±0.01% per hour. Unlike many other calibrators on the market, the LS3300 includes as a standard feature the ability to output currents of up to 62.5 A for long periods of time. Further, three LS3300s can be synchronized to easily output currents of up to 180 A, thus enabling the calibration of instruments such as smart meters and shunt-resistor current sensors. A single LS3300 can calibrate power meters on a single-phase two-wire power circuit. Multiple LS3300s can be used together to calibrate power meters used in single-phase three-wire AC power and three-phase AC power measurement. Using the multiunit control feature that is provided with all LS3300 calibrators, it is possibly to automatically set the voltage, current, power factor, phase, and other values on slave LS3300 devices by performing those settings on a single master LS3300 device. This significantly reduces the amount of time needed for single-phase three-wire and three-phase AC power calibration. * A single-phase two-wire system uses two conductors to carry the power of a single circuit, and a single-phase three-wire system uses three conductors to carry the power of two circuits. Three-phase AC power is a combination of three single-phase AC circuits.